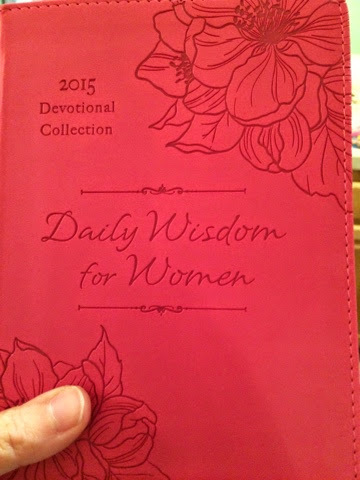 About a week ago in the mail I got a great daily devotional bible for women. First and foremost this book is absolutely beautiful. I actually went and sat down to read it and didn't realize that it was for 2015 (despite the fact that it says so on the cover). 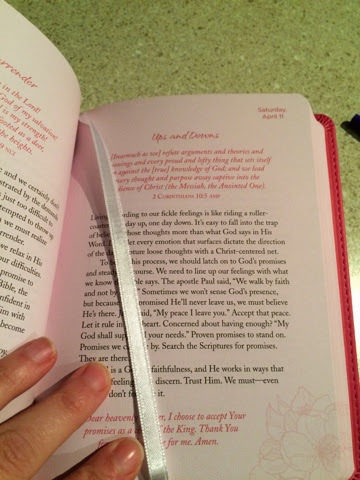 Unlike the other devotional that I bought myself it has the verses that you will be reading with the discussion right on the page. For me who isn't that familiar with reading the bible it made it easier then locating verses in the bible itself and then reading the talking points. Here is a sample page. For every day there is the actual scripture and then some reflection points. What I like is that they are short but also what is written is very easy to understand. I actually had contemplated starting reading it out of order because I was looking for some guidance in these days of figuring things out with the death of my father. Then I realized that it is geared to specific times of year so I guess I will have to wait...which is the only thing I didn't like about this devotional. So for anyone who is looking for some daily religious readings or to get more in touch with their spiritual side I would encourage them to pick this up. For such a lovely looking book the price point is very reasonable at well under 20.00. This might make a lovely Christmas gift for those who enjoy a more religious gift at the holiday season. I would highly recommend this item.